This weekend's food and wine pairing at the Frick Winery was a smashing success! We served a record 1,200 guests, and had a lot of fun doing it. I'm still catching up on a massive email backup and have some deadlines at About.com to meet, but I hope to do some video recipes of the items soon. For now you have to settle for a quick photo (click to enlarge) and description. By the way, special thanks to Bill, Dallas and the entire Frick family, as well as our incredible kitchen crew; Al, Peggy (this year's MVP), Julie, Merv, and my beautiful and talented wife Michele! 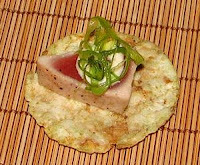 The first item was wild Ahi tuna seared and served rare on a wasabi rice chip. It was topped with a pink ginger dressing and a pinch of seaweed salad. It was probably the most popular bite we served. It was paired with Bill Frick's white wines; a Grenache Blanc, and Viognier. The second item was ripe Cambazola cheese served on fig bread, with sweet organic strawberries on the side. This is called the "Cinsaut Classic" since we've served it with the Frick Cinsaut wines for the last 12 years! It's a perfect pairing, and while we change the food pairings every year, this bite remains a sweet, salty, and savory constant. 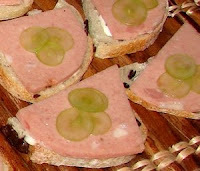 The next bite was a pistachio mortadella on olive bread with shaved grapes. This was paired with the Carignane. This idea was borrowed from Chef Tom Colicchio (head judge of Top Chef). He has a sandwich restaurant in San Francisco called "Wichcraft" and these ingredients made up a sandwich Michele enjoyed last year. 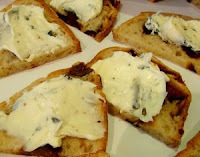 The flavors worked so well together, we thought it would make a nice canapé. Next came a mini-meatball sandwich. Olive oil and spicy tomato sauce were spread on some herbed focaccia, which was topped with a slice of meatball, Parmesan, and fresh mozzarella. A little garlic oil and Italian parsley finished this delicious bite. It was paired with a Merlot, and Frick's new Red/Red, which is a Cabernet/Syrah blend. And last, but in no way least, was a wild boar sausage skewered with a black mission fig and watercress leaf. It was served on some crushed hazelnuts, and paired with Frick's magnificent Syrah. The sweet dried figs were quickly poached in the Syrah, sugar, and black pepper. This was probably my favorite bite, and a great combination of flavors and textures. I will hopefully be caught up soon, and back with new videos and other assorted foodie fun. I hope you enjoy the photos and descriptions, and maybe even order some wine from the Frick winery. Cheers! Great Report and welcome back!! We DO want those recipes. I agree with the first comments... let's have some new video recipes! I had the good fortune of attending the Passport weekend and sampled food and wine from 23 different wineries; no mean feat, as you might imagine. The food and wine pairing at Frick was unquestionably the most successful. Every combination demonstrated the capabilities of Bill Frick's wines, causing me to buy some. Great job.